aaaWilliam's gravestone in the Congregational Church cemetery says he was born in "Drumbloo" (prob. Drumlough), Co. Down, Ireland and apparently that he had lived in New England for 24 years. Aside from the short but much welcome biography, the gravestone is a maginificent and unusual work of stonecarving. A skeleton reclines in the arch at the top, and the text is a well-executed combination of regular and italic letters. There is a stone next to William's that surely is Mary's, but it is very badly worn. The information on it apparently was transcribed in the town's vital records before it became illegible. 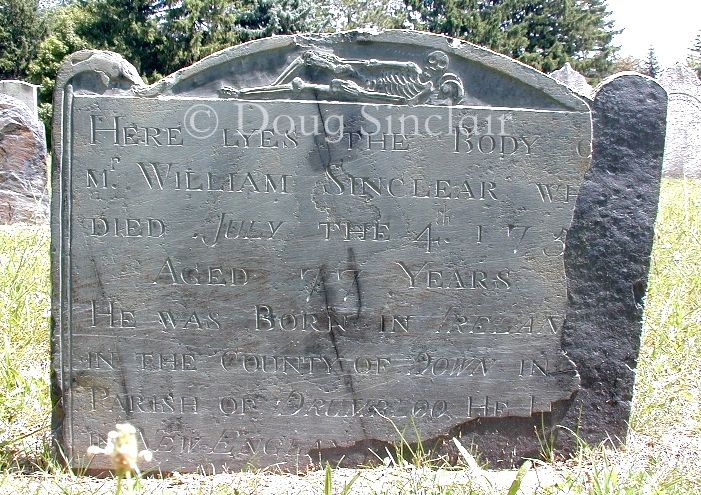 sources for vital records: William's gravestone in the Spencer Congregational Church cemetery gives his death date (the year is now damaged but recorded in the town's vital records of the early 20th century) and that he was 77 when he died. It also says he was born in "Drumbloo," Co. Down, Ireland, and had been living in New England for 24 years?